Sicily is a land that holds many wonders. Between the sea, the sun, the rich history, and the spectacular food and wine, there is much to delight the senses. One of the most fascinating things about Sicily is the mix of cultures that have left and impact on the land, whether in the form of architecture, culture, language, and in this case food. Sicily has been inhabited by the Spanish, Arab, Normans, and Greeks, and their mix of footprints can still be seen today. The Sicilian kitchen is based on local, available ingredients. One of the most traditional dishes is called “Caponata,” a mix of fried vegetables including eggplant, peppers, and celery. Slightly similar to ratatouille, this dish combines local vegetables with a sweet and sour finish. In the case of caponata, the Arabs brought the tradition of the ‘agrodolce’ sweet and sour sauce. On the western side of the island where they landed, you will find agrodolce couscous still served today. The Sicilian kitchen is based on local, available ingredients. 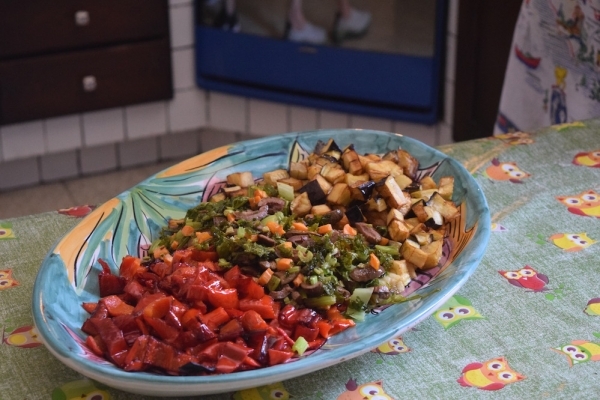 One of the most traditional dishes is called “Caponata,” a mix of fried vegetables including eggplant, peppers, and celery. Slightly similar to ratatouille, this dish combines local vegetables with a sweet and sour finish. The following recipe is from our friends at ‘Smile and Food,’ a local cooking class in Ortiga (the historical center of Siracusa). When visiting Siracusa, one of the neatest things you’ll find is the outdoor fish market, where you can find everything from traditional spices and local produce to the fresh catch of the day.. and then some. 5. Place all ingredients back into pan, add olives, capers, pignoli nuts and sauté all together for a 5-8 minutes. 7. Allow to cool completely before serving. 8. Enjoy with crostini or your favorite bread. Buon appetito!